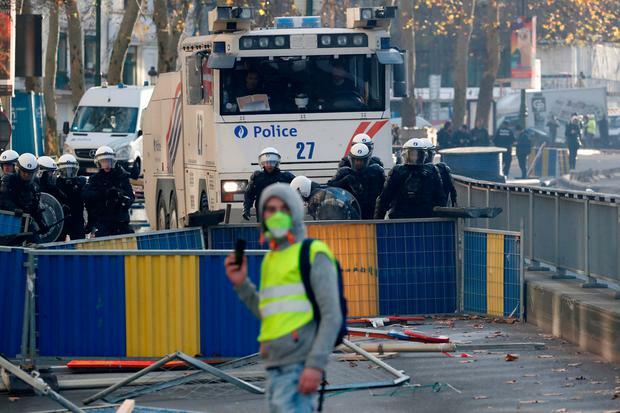 Belgian police fired water cannons and tear gas in central Brussels to drive back protesters inspired by France's "yellow vest" anti-tax movement who hurled rocks at the prime minister's office. Police made dozens of arrests and protesters destroyed at least two police vans as a peaceful but unauthorised demonstration - lacking clear leadership and largely promoted on social media - descended into violence as people, many masked or hooded, tried to breach police lines. For three hours, crowds complaining about fuel prices and a squeeze on living standards had disrupted traffic and walked the streets. Police said they arrested about 60 before the violence, mostly for blocking roads or carrying large fireworks. Several hundred people wearing the fluorescent safety vests drivers must carry in their vehicles eventually converged on the office of Prime Minister Charles Michel. Dozens, many of them masked, threw rocks, firecrackers and road signs at police who doused them with high-pressure water jets and fired gas rounds. Protests in Belgium took place notably around fuel depots in the French-speaking south, inspired by French demonstrations against increases in fuel duty imposed by President Emmanuel Macron's government as part of efforts to reduce carbon emissions." Mr Michel voiced sympathy for people's troubles earlier, but added: "Money doesn't fall from the sky."